There is no denying that Apple products are always better than other brands. But, they are also costly as compared to other devices. For example, MacBook Pro is one of the highly advanced laptops that offer great flexibility and features. But, when you look at its price, you’ll realize that not everyone can afford it. However, many people don’t care about the cost and purchase it even on EMI. Now, how would they feel if their MacBook Pro breaks accidentally? It’s no less than a disaster. At first, many people wouldn’t even believe that their MacBook is broken. But, it’s true! People often break their MacBook Pro accidentally, and later on look for ideas to utilize it. Now, there are only two ways to utilize it, either fix it or Sell MacBook Pro. When you look for ideas to fix a broken MacBook Pro, you’ll find some good solutions on the internet. But, to fix a laptop, you’ll either have to replace the damaged parts or if the screen is completely damaged, then the replacement cost will be very high. Also, replacement of MacBook Pro is not as simple as other laptops. You need a professional technician who knows how to replace the MacBook Pro screen and other parts. And when you hire a technician, you’ll have to pay him. So, you can see the overall cost of fixing your MacBook Pro will be much higher than your expectations. For people who bought MacBook Pro on EMI, fixing is not a good option. So, selling broken MacBook Pro is the only option left. 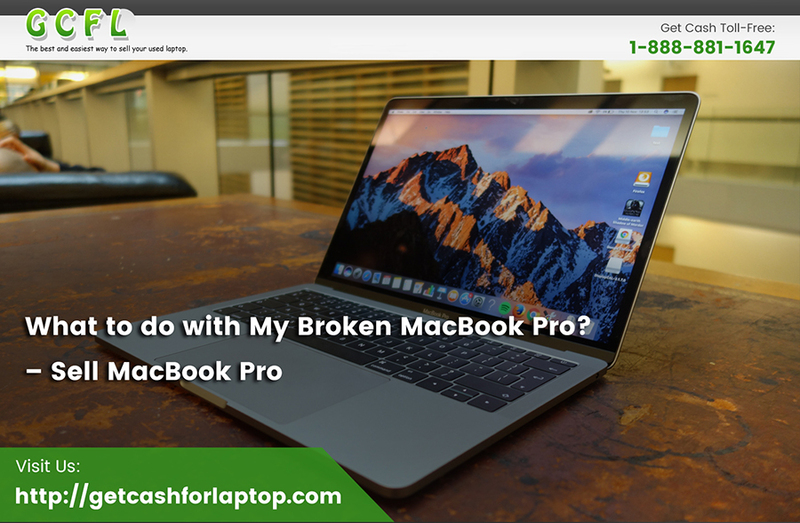 If you want to sell your broken MacBook Pro, then GetCashforLaptop is the right platform for you. We are recognized as one of the best vendors who accept broken laptops and MacBook. We provide fast and secure service for our customers so that people can easily Sell Used Laptops at a fair price. Also, the overall process of selling your laptop is very simple and straightforward at GetCashforLaptop. To sell your MacBook Pro, you’ll have to submit a quote on our website. After receiving the quote, our team will email you a free shipping label; use this label to ship your MacBook. We’ll do a complete inspection of your laptop after receiving it. After the inspection is complete, you’ll receive your payment via PayPal or check in your email. For further queries, visit our website or contact us at 1-888-881-1647.